A pair of Notre Dame defenders wrap up a Green ballcarrier on Friday evening. Green’s D.J. Barker takes a handoff on Friday evening. 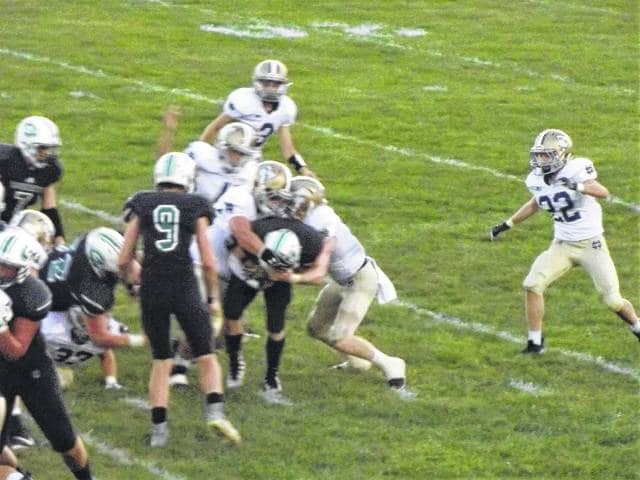 FRANKLIN FURNACE — In a hard-hitting, nail-biting, boots-on-the-ground kind of game Friday night, the Titans of Notre Dame and the Bobcats of Green proved to be evenly matched all while showing excellent poise in crucial moments. However, at the end of the day, it was the Titans who stood tall. Behind an incredible 16-point rally over the final 7:34 of an SOC I bout against Green — one that was capped off by a 42-yard touchdown pass from Caleb Nichols to Ben Mader and a successful two-point conversion run — the Titans were able to overcome a seemingly insurmountable 22-8 deficit en route to a thrilling 24-22 victory over the Bobcats in a possible game-of-the-year type result across the county lines. For Bob Ashley, the contest was a thrilling affair that he’ll certainly remember. “It’s one of those games where you really hate to see anybody lose,” Ashley said. “We made some big plays, and that’s what it came down to, it really came down to making a few big plays. But overall, I feel that Green did a heck of a job. Hat’s off to them. (Ted) Newsome did a great job this week game planning for us. He knew what was going to work against us. As for Ted Newsome, the outcome of the contest proved to be heartbreaking for the fourth-year leader of the Bobcats’ program. From the outset, Green’s sizeable offensive line asserted its will early and often. The Bobcats, in fact, collected 182 more tallies offensively than Notre Dame, with the Bobcats obtaining 327 yards of offense and the Titans finishing with 145 total yards of offense. Lonnie Smith, on his own, collected 203 of those 327 yards, including 41 yards on five carries during a drive that put Green in front by an 8-0 tally with 8:58 left in the first half. Notre Dame, however, used the speed of Ben Mader to exploit the Bobcats on the second half kickoff. Mader, who proved to be nothing short of stellar throughout the affair, not only raced 71 yards for a score, but added the ensuing two-point conversion to tie the score at 8 apiece. However, Green showed poise of its own behind the legs of Smith. Over the Bobcats’ next pair of scoring drives, the 6-3, 180-pound freshman ran for 81 yards between the two drives as Smith aided Green on a 16-play, 79-yard drive to give the Bobcats the lead, then ran for 39 yards on an eight-play, 46-yard drive that the standout eventually capped off with a five-yard touchdown run to put the Bobcats in front, 22-8, with 7:34 to play in the contest. The upperclassman standout, however, was not able to be upstaged. On the ensuing drive following Smith’s five-yard touchdown tote, Mader proceeded to take a handoff 45 yards en route to paydirt in just three plays as the Titans closed the gap to a 22-16 margin with 5:57 left in the final stanza. 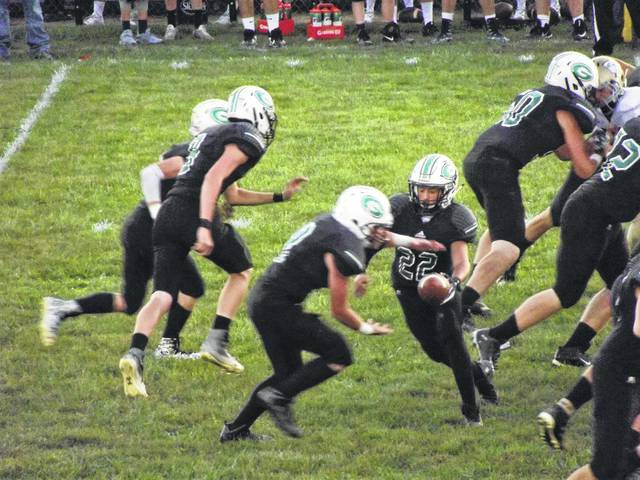 After being pinned inside its own five yard line, Green showed its resiliency as the Bobcats ran nine plays for 39 yards to not only drive out of dangerous waters, but nearly run out the clock in the process. Green, however, was stopped on their own 44 with less than a minute to play, where the Titans took over on downs. That point is when the unexpected happened. With Mader starring all game in multiple areas, the Titans dialed up a pass play to obtain the winning score. And the junior, like he had throughout the affair, came through as Nichols found Mader for the 44-yard touchdown pass to tie the score. Then, for the second time this year, Notre Dame converted the ensuing two-point conversion to give the Titans a 24-22 lead with 43 seconds to play. The score would hold true to the horn as Notre Dame collected an amazing come-from-behind victory. As far as Newsome was concerned, there wasn’t much more his team could’ve done. With the victory, Notre Dame improved to 2-4 overall and 1-2 in the SOC I, while Green fell to 1-5 overall and 0-3 against SOC I competition. The Titans will make the trek to Symmes Valley next week, while the Bobcats will head to Manchester for what will be Green’s final nonconference matchup of the year.